There is something utterly unique about the Scapa 16. The distillery is one of two located on the Orkney Isles and doesn’t have a huge number of variants compared to its neighbour Highland Park or nearby north highland distillery Old Pulteney, but it is a rare event that someone deems Scapa a poor performer. Usually classed as one region, the Islands group produces a very diverse range of whiskies. The Islands of Skye and Mull have the smokier sea-spray flavours typically associated with the Islands, due to their closeness to Islay and how most people think of the Islay big three when they think of any distillery off the Scottish mainland. The Islands at the north of Scotland bring something different to the table. Without the peat and brine, flavours can be more subtle and well-defined. 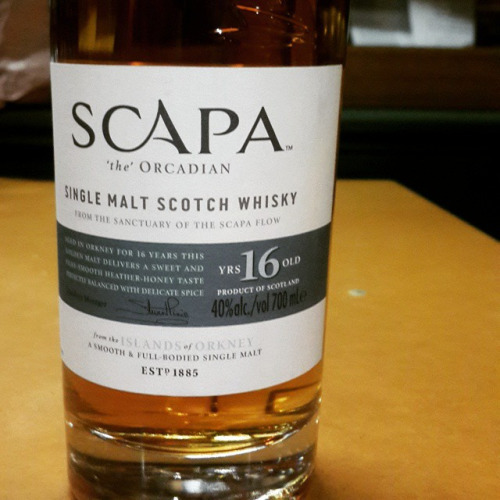 Scapa 16 is certainly no exception. This is even more true of Scapa which transports its water source to the distillery through pipelines to avoid it flowing through peaty soil. The distillers at Scapa have played with its product for many years. The distillery only has one wash and one spirit still so the methodology is all about perfecting the flagship whisky. It began as a 12 Year but the distillery fell idle for a decade between 1994 and 2004. To kick-start its revival, the 14 Year was released but tinkered with five years later to create the 16 Year, which spent an additional two years in American oak casks. To this day I have not had such a fresh and vibrant whisky. On the nose there is an instant fresh grass smell, like blades of green by a riverbank. There are wafts of other greenery like the blooming heather on the lochs. There may even be a touch of the lyrical wild mountain thyme. There is also a deliciously light note of strawberries. On the palate the strawberries are evermore present and develop from a freshly picked smell into an artificial or candied strawberry taste. They take one back to the kind of strawberry in strawberry ‘liquorice’, which also may explain the slight aniseed taste that also comes through towards the finish. On the Mooresy scale of quality, if I was to write a whisky bible, the Scapa 16 would sit at a 9.5/10 (nothing’s perfect, right). It will always be personal taste, but there is something about this one: a quality about the Scapa 16 that transports you to a relaxing day on a farm in spring, with a gentle breeze and babbling brook. Do yourself a favour and set up a chair in your backyard, grab a good book, pour yourself a bumper of Scapa 16 and find your place to which the dram will transport you.